^ Andrews, Donald H.; Richard J. Kokes. 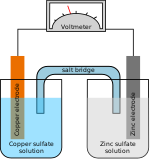 Electrochemistry. Fundamental Chemistry. New York: John Wiley & Sons, Inc. 1962: 482.